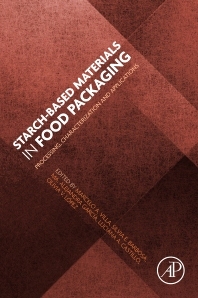 Starch-Based Materials in Food Packaging: Processing, Characterization and Applications comprises an experimental approach related to the processing and characterization of biopolymers derived from different starches. The book includes fundamental knowledge and practical applications, and it also covers valuable experimental case studies. The book not only provides a comprehensive overview concerning biodegradable polymers, but also supplies the new trends in their applications in food packaging. The book is focused toward an ecological proposal to partially replace synthetics polymers arising from non-renewable sources for specific applications. This tender implies the protection of natural resources. Thus, the use of starch as feedstock to develop biodegradable materials is a good and promissory alternative. With the contributions and collaboration of experts in the development and study of starch based materials, this book demonstrates the versatility of this polysaccharide and its potential use. Chapter 6: Food packaging: properties and characteristics. got the degree of Chemical Engineer (1988) from Universidad Nacional del Centro de la Provincia de Buenos Aires (UNCPBA) and the degree of Doctor in Chemical Engineering (1992) from Universidad Nacional del Sur (UNS), Argentine. received her degree in Chemistry in 1990 from Universidad Nacional de Mar del Plata (UNMP). Her research focuses on the development, characterization and application of hydrocolloid-based films. Her workplace is the Centro de Investigación y Desarrollo en Criotecnología de los Alimentos (CIDCA-UNLP-CONICET). graduated in Chemical Engineering from Universidad Nacional del Sur (UNS), Argentina, in 2004. Her research interests include processing and characterization of composites, studying synthetic and biopolymeric matrices, in order to develop proper materials for food packaging applications. is Chemist (1999) and reached a master’s degree in Food Science and Technology in 2006, both from Universidad Nacional del (UNS) of Bahía Blanca. Her research mainly focuses on the development, characterization and application of starch biodegradable films, especially in food packaging. Nowadays, her research is being carried out in the Planta Piloto de Ingeniería Química (PLAPIQUI-UNS-CONICET). She is author of sixteen international scientific papers, one book, three book's chapters and she has around fifty presentations in National and International Congress. got the degree of Chemical Engineer (1986) from Universidad Nacional de La Plata (UNLP) and the degree of Doctor in Chemical Engineering (1991) from Universidad Nacional del Sur (UNS), Argentine. He did a postdoctoral stay at the Department of Materials Science, Massachusetts Institute of Technology, USA, from 1992 to 1994. Now, she is a Senior researcher from the National Research Council of Argentine (CONICET) and Full Professor at the Chemical Engineering Department of UNS. His main research lines are related to polymer science and technology, including synthetic and natural polymers. Particularly he has expertise in: synthesis and characterization of taylor made homo- and block-copolymers, extraction, characterization and physical and chemical modification of biopolymers as well as polymer composites. He was the advisor of eight doctoral theses, he is author of more than seventy papers in international journals, five book's chapters and presented more than a two hundred and fifty papers in National and International Congress.